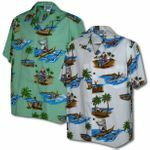 Woody Christmas - Mele Kalikimaka Men's Go Barefoot Aloha style shirt. Embroidered with Mele Kalikimaka (Merry Christmas) on the pocket and large embroidered Woody and Santa Design on the back is Available in Black and Stone/Beige . Go Barefoot Men's shirts have genuine Coconut Shell Buttons. All Go Barefood shirts in limited quantities in our Maui Showroom & in the California warehouse. These shirts are sewn and made to fit comfortably inside or outside your belt waist. The measurements are approximate and will vary slightly. They have been determined from random selections of hundreds of prints. These are NOT fitted shirts. Consider: "Hang Loose" - be comfortable. It is advisable to select a shirt size that is a few inches larger than your chest measurement for the best comfortable fit. There is no top button to close the neck. Please call: 1-866-MAUIMAN. (866) 628-4626 - If you need a specific measurement or additional informaton.